Twitter has revealed that the European Championship football (soccer) final between Spain and Italy, in Kyiv (Ukraine) yesterday, broke its record for sports-related tweets after logging 15,358 tweets per second at peak. The record was racked up during the fourth goal of the game, which saw Spain retain the title with a convincing 4-0 win. Furthermore, the microblogging service has revealed that the final match of 3-week long tournament trigger a staggering 16.5 million tweets from across the world, as fans flocked to the service to share thoughts, discussion and rants from the sidelines during the deciding fixture. 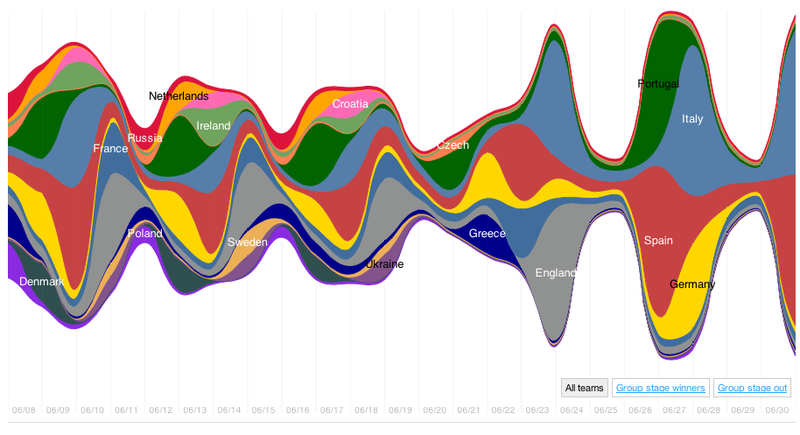 As this nifty graphic from Twitter shows, Euro 2012-related mentions were highest after goals were scored, while a marked high in tweets can be observed around the opening game, two semi-finals and the final. The support of a number of mainstream media — including the BBC’s football team — has undoubtedly helped the service gain increased traction among all manner of fans from across the world, who weighed in on the European tournament. 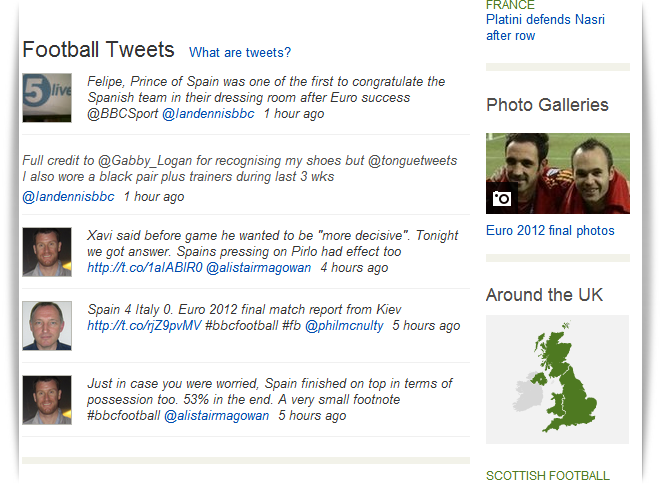 The BBC’s website, for example, contains feed from all of its football correspondents, while responses and thoughts from readers are included in live commentary feeds and other sections of the site. Twitter put serious preparation into covering the event — and launched a dedicated #Euro2012 microsite — and it continues to break records across all areas and subjects. With the next major football tournament, the FIFA World Cup, set to take place in 2014 in Brazil, we can bet that this record is certain to be overtaken. First up is the London Olympics this summer, and we suspect that this newly set record will soon be overtaken by the Games, which will attraction the attention of Twitter users worldwide, thanks an appeal that is broader than football. Twitter is likely to face fiercer rivalry from Facebook at the Games, after the world’s leading social network unveiled its Olympic push with the launch of an ‘Olympic hub’ – a central resource for pages from competing teams and athletes. The sports record is some way behind Twitter’s overall record of 25,088 tweets per second, which was set when popular Anime movie Castle in the Sky was broadcast in Japan in December 2011. China’s Twitter-equivalent Sina Weibo actually topped that, after it clocked 32,312 messages per second during Chinese New Year.